Nothing beats the feeling of warming yourself from the inside out with hot and hearty soups in the midwinter months, but once the sun returns to shine upon our spring ready faces, we're usually quick to leave soup season behind. 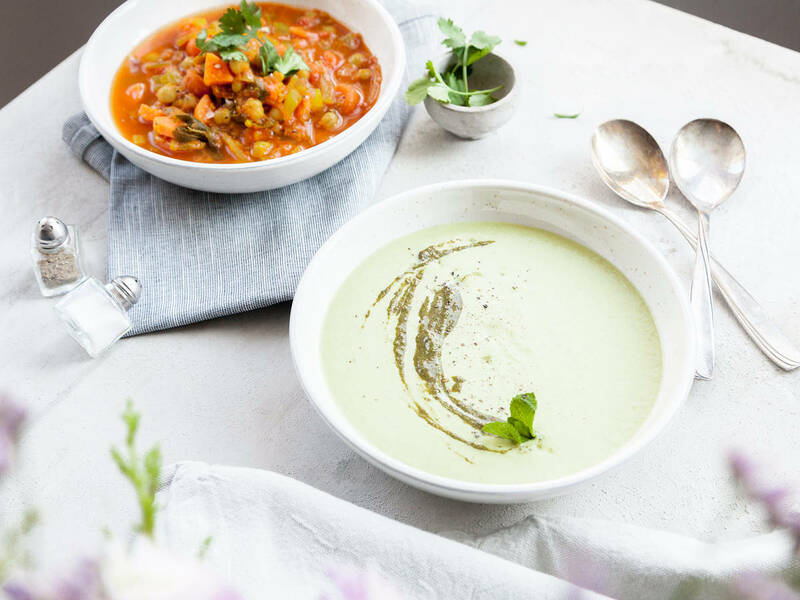 But it's about time for a rethink, because the fresh range of vegetables and herbs available in spring make some of the best blended soups, toppings, and bright additions to warm broths. Here's our case for extending the soup season. The eye-catching cousin of broccoli, Romanesco makes a great soup base, but can also be enjoyed simply roasted or sautéed. This easy soup comes together in just half an hour, with coconut milk adding a creamy texture to the nutty, slightly bitter bite of the Romanesco. Eat hot, cold, or somewhere in-between, but don't forget about topping your bowl with a hefty spoonful of that walnut-mint pesto! Also try it with a swirl of yogurt for added richness. Layers of strong flavors meld seamlessly in this pea soup. Swap fresh peas for frozen if you don't mind spending some time shelling them beforehand–it's worth it, as the flavor of fresh peas adds another dimension to this simple soup. Enjoy it hot or cold, with fish or without, and don't be afraid to experiment! Loaded with vegetables, herbs, and a kick of heat from harissa chili paste, this Moroccan-inspired chickpea soup is as warming as it is refreshing–you can thank the fresh herbs and lemon for the latter. Play around with different vegetables, adding in nearly anything you can find at the farmers market from new potatoes to fresh peas, zucchini to eggplant. Top it with thinly sliced radishes for a pop of color and crunch! Our simplified version of the traditional Provençal fish stew might just have you aching for a visit to the French Riviera. An assortment of fresh Mediterranean fish, mussels, and shrimp will jostle for a place on your spoon and the deep flavors of the fragrant soup will make themselves known with every mouthful. Creamy and rich, this soup lets the flavor of asparagus take center stage. Eaten warm or cold, you can use leftovers in a myriad of unique ways, from saucing up poached eggs on toast to coating pasta and fresh asparagus before baking into a cheesy casserole. Asparagus lovers, rejoice! If the spring weather permits–which we certainly hope it does–get fired up and grill those tomatoes in lieu of roasting, for a tomato soup with a twist. Simply sauté the other aromatics and add the grilled tomatoes in before puréeing.